In theater as on television, political content increasingly arrives by Trojan horse. In the Netflix series “Orange is the New Black,” creator Jenji Kohan openly admits to using the promise of a story about a pretty, white, upper-class inmate as a delivery system for stories about the black and brown women whose lives eventually become the heart of the show. What he delivers, in a fine production directed by Scott Behrend and featuring memorable performances from David Mitchell, Aaron Krygier and Lisa Ludwig as siblings fighting a civil war at their late father’s decaying Arkansas estate, is something else entirely. Beneath its slicing humor and deep emotional intelligence, the play is in fact a withering indictment of white privilege in the age of colorblindness, a merciless anatomy of an American family caught in a toxic bubble and doomed by their own ignorance to exhume and perpetuate the wrongs of the past. And, in the case of “Appropriate,” it’s hard not to. 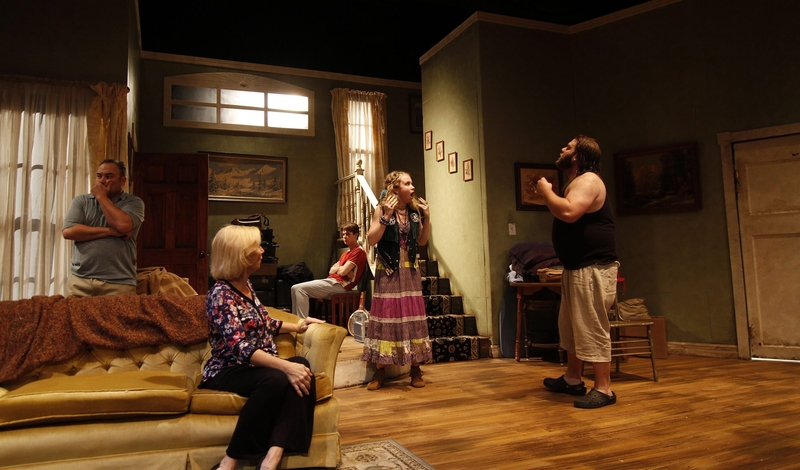 On Dyan Burlingame’s excellent set, a homier and more run-down version of the two-tiered “August: Osage County” homestead and illuminated by John Rickus’ characteristically sensitive lighting design, three branches of the Lafayette family converge to rehash old family issues and settle the estate of their recently deceased father. During this toxic process, the siblings discover an extremely unsavory secret about the house and their late father that gives the play its central thrust. The way each character reacts to that discovery – whether with curiosity, revulsion, opportunism or apathy – is an indictment directly of a culture that too often deflects responsibility for racial violence and inequality onto other people who, conveniently, usually happen to be dead. But Jacobs-Jenkins isn’t buying that excuse, putting all manner of toxic words into the mouths of his characters, from the teenage Lafayettes (Renee Landrigan and Dan Urtz, each pitch-perfect) to their supposedly more enlightened parents. Mitchell’s performance as is a highlight of the production, alternating between vibrating, Louis Black-level outrage and bemused resignation to the insanity of his relatives. Ludwig, whose overwritten character Toni is a waking storm cloud constitutionally incapable of forgiveness and one of the biggest downers ever conjured for the stage, gives a bravura performance that lends the production much of its forward momentum. Fine interpretations also come from Krygier as Franz, a man thirsting for redemption his siblings are loath to grant him, Kelsey Mogensen as Franz’s bright-eyed hippie girlfriend and Lisa Vitrano as a Brooklyn-born progressive who cannot fit her worldview into the Lafayette’s toxic box. In this play, the moral of the story is that nothing fits. There is no satisfying resolution, no happy ending, just a ghostly fade to black, aided in an important way by Katie Menke’s remarkable sound design. To be sure, the family fireworks by themselves would make this play worth the trip. But it’s their employment as a Trojan horse for a devastating and necessary message that elevates this piece from entertainment to art. Being tricked has never felt so rewarding.